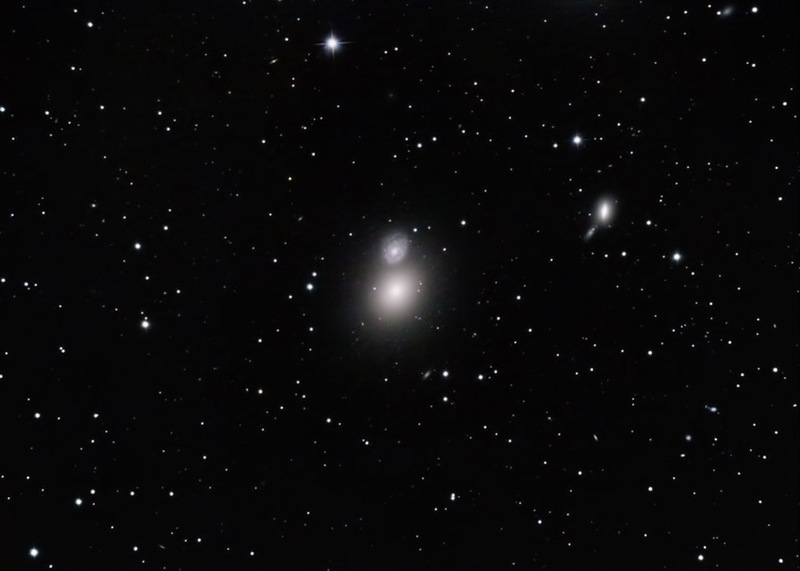 At a distance of 60 million light years, M60 is the third brightest eliptical galaxy in the Virgo Cluster. It is a massive galaxy, about five times larger than the Milky Way. The spiral galaxy that appears adjacent to it is NGC 4647. Despite appearances, these galaxies are not interacting with each other. Images were focused using Live View. They were converted in Canon Digital Photo Professional. They were then aligned and combined in ImagesPlus. The final was adjusted (Levels, Curves) in Photoshop. Topaz DeNoise was used to reduce noise. My backyard observatory in southeastern Minnesota on 4/21/12. Note: Seeing was average; temp: 30 F; humidity was 88%.